Wondering if you can shed some light on a few issues that I have with my 987 05 2.7 Boxster. 1) The front fog lights do not work ... 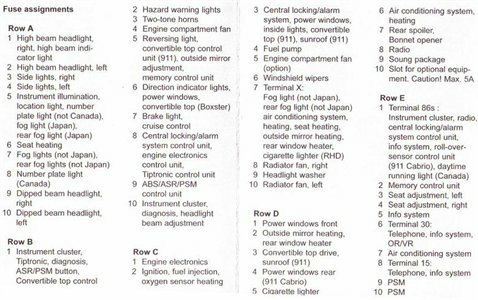 I think I should check the fuse first before replacing the bulbs, but unfortunately I do not have a fuse diagram...I googled it, and found a diagram but could not locate which one is the front foglight fuse on the halogen version 987...could someone tell me which 1 it is please? 2) The PSM failure light comes on every time after about 20 minutes of driving on the motorway at speeds of more than 60mph... it cancels itself when I switch off and re-start the engine, and never comes on around town. What could this be? If you pull the fuse cover off then there should be a booklet listing what all the fuses are for on the cover . I take it the headlight switch does have the symbol for front and rear fog lights on it ? Day runners or home lights spring to mind if not . For the fault then it will need a code reader and the code read out as there are many things it could be im afraid . A guess would be a speed sensor on one of the wheels dropping out at speed due to a weak signal ..
Also does the head light switch have the x2 symbols for front and rear fog lights ? Its just im wondering if they are the home lights .. switch onto home then lock the car and see what works . So would I be correct in saying that the fuse should be A5? Fuse would be A 7 , you also have C7 but other things wont work if its that one . Home lights not working And front fog lights , check the fuse and the bulbs as it may be simple but i think this is going to end up a little bit more involved , the control unit responsable is the front end control unit . A vehicle handover useing a tester would be the next step if its not fuse or both bulbs . OK I checked A7...seems fine, will check bulbs...and then take it from there. Dermot would it not be A3&4? What he is calling fog lights maybe his side lights? OK you know you have the main headlight housing with the main beam and dipped beam...and then you have the white rectangular housing on the bumper below the headlight which houses the fog light and the sidelight...the sidelight bulbs work fine, but the fog light bulbs don't. I have the fog light option on the control panel (i.e. 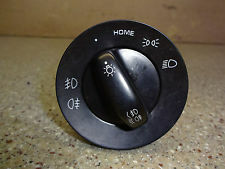 turn the switch to side light or beam position and pull it out, and a green foglight light comes on the dash next to the switch)...however the fog lights don't work. I have tried putting the switch in the "home" position...from my understanding this should activate the fog lights once you press the "unlock" on the remote...again - no luck. Ok that clears it up. Yes they are your fog lights. To turn them on you pull the switch once in the lights on position. Just to clarify things as im getting a little confused now lol .. is your headlight switch the same as the image below .. ie does it have both symbols on the left side of the switch . If it does then its a codeing fault , blown bulbs or a possible wiring fault .. ie not plugged in . Im no expert on function operation but the home setting is for when you lock the car so you have illumination when you walk away from the car .. at least thats what i thought so try that please. Also if you have a PCM fitted then hit the set button and see if theres an option for day runners . Yes sir that's the exact same switch that I have. Once I change the bulbs if it still don't work I might have to bring it to you.